Top rated challenger Jarrell ‘Big Baby’ Miller is ready and waiting for the call should Anthony Joshua opt not to fight WBC heavyweight champion Deontay Wilder or undefeated Tyson Fury in 2019. Joshua has a big decision to make over his next fight in April, with a heavyweight unification bout against Wilder his preferred option. At the moment, Joshua is slated to defend his WBO, IBF, WBA, IBO heavyweight titles on April 13th at Wembley Stadium in London. However, the pair’s respective representatives have previously struggled to agree a deal for the duo to meet and an announcement has yet to be made. That could leave the door open for Miller, with Madison Square Garden touted as a potential venue should Eddie Hearn and Matchroom Boxing come calling. “Jarrell is the best American heavyweight, and has always expressed his interest to fight Joshua, so the ball is in his court,” his promoter Dmitry Salita told Sky Sports. 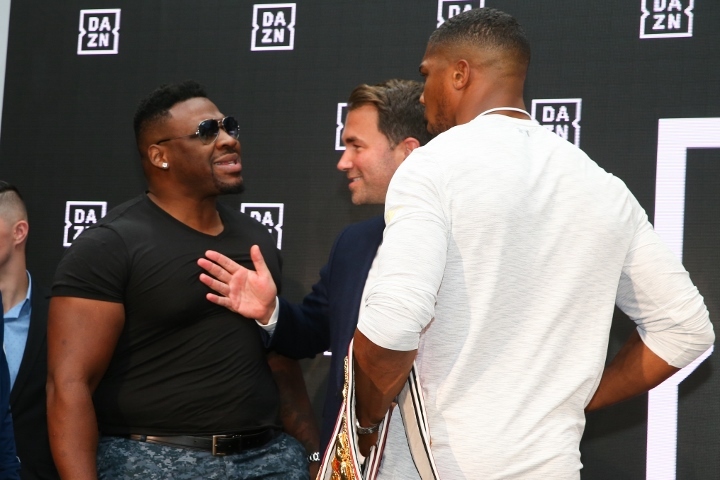 There are heavy rumors that a Joshua vs. Miller contest could take place – if other options for the British superstar fall out. Miller is undefeated with 23 wins and one draw from his 24 career fights, having knocked out Bogdan Dinu in November. Briton Dillian Whyte is also in the mix to face to Joshua in a rematch, and many view him as the frontrunner to get the call. Joshua knocked Whyte out in the seventh round back in December of 2015.